Located in Woodland Hills, California. 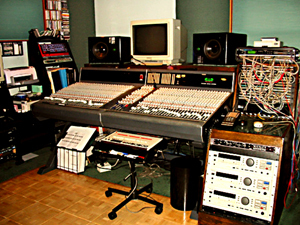 Filmscores, instrumental music recordings, vocal recordings, and songwriting projects are recorded on 24 track analog and 96 track digital computerized state of the art recording studio with automated console. This is Osamu's world with fish, waterfalls and hot tea. "The most exciting thing for me is the different kinds of projects that come into the studio that I produce. One month world music, then jazz or urban project, then dance and techno then Japanese traditional music. I love the diversity."